As a gun owner, I'm always looking for something to clean and lubricate my pieces. Sure, you can buy a bore solvent, gun grease and oil, and probably a myriad of other products to do same. What I really wanted was Ballistol, but no one in my area, other than a place in Eaton Rapids, which is out of my way has it. Most, even in gun stores give me a blank stare as if I were speaking Aramaic or Reformed Egyptian (whatever that is). I've used and still use Rem Oil for the most part. It does a good job, is readily available and gentle on composite parts. I've also used Gun Scrubber and brake cleaner to get the tough stuff cleaned off, but these aren't the most economical either. Besides, space in my place is at a premium. The less cleaners and lubricant varieties I have to store, the better. I went to Gander Mountain and asked for Ballistol, got the thousand yard stare (I love Gander Mountain) and went to find a cleaner/lubricant. What I found was Break Free CLP, by Safariland. It reads right on the can, "cleaner, lubricant, preservative." Sold, for about $10. After firing about 50 rounds through the Bersa .45 and 100 or so through the Ruger 9mm, I assumed there would be enough dirt to effect a good test. The guns are aluminum and tool steel, glass reinforced nylon and stainless steel respectively. I field stripped both guns and lightly sprayed this cleaner enough to soak the metal. What I noticed right away is that this stuff foams big time. It also broke the powder and any fouling loose that was present and coated everything with a film of oil, so much that I had to wipe my guns down several times to remove the excess film. This was especially true with the composite frame on the Ruger, or the hard rubber grip on the Bersa. Even now, several weeks later there is still a goodly residue on all the moving parts of both guns. 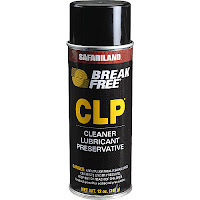 Another benefit is that the dust and dirt that normally get mingled with the lubricant are just not present with CLP. My review on this product will have a part two, but my first assessment is to be very careful that you don't overapply this stuff as it make things slippery in a hurry. It's nearly impossible to clean off the excess, which is a lot thereof. A very light touch on the button is all you need... to be continued. Maranatha!